Laundry done, week of meals made, floor swept, everyone clean and fed, now I want to relax. Too bad I have to go to work tomorrow. 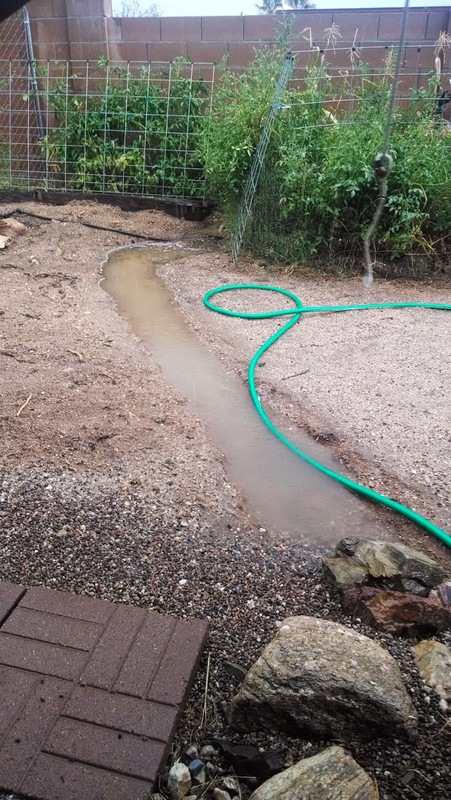 It didn't rain until late this evening but I finally got to see how my drainage trenches worked. Not bad, but the water was getting a bit too close to the shed. I'll have to do some more digging. I started digging deeper trenches on the other side of the yard but it was hot and the ground was still hard this morning. After I get all of this digging done, I get to do the fun part, filling it with mulch so that I don't fall in the trenches anymore. The dogs think that all of this digging is fascinating and they have been doing some digging of their own, usually not in the right places. What else did I do this weekend? I went to visit my mother and helped her get her computer back on the internet. I think the storms messed with the connection. I brought some extra seeds too. We planted tomatoes, green beans, and squash. 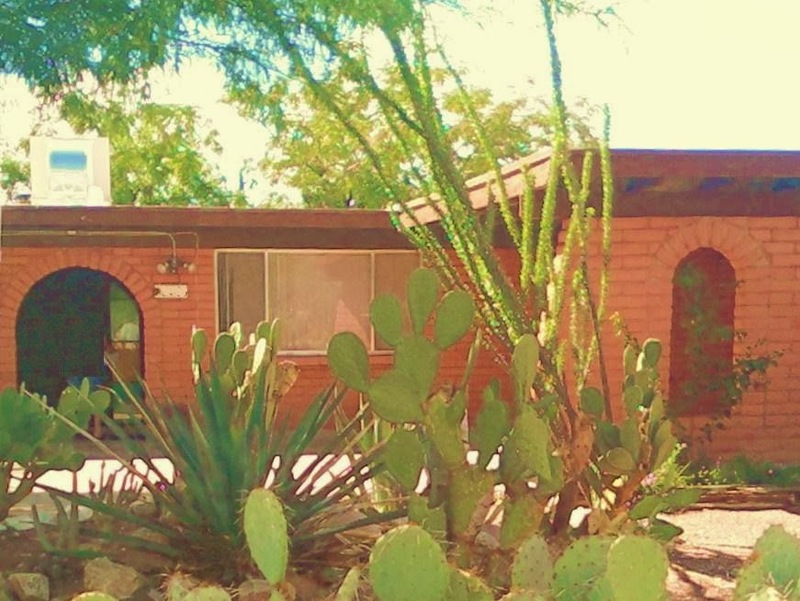 Tucson has 2 growing seasons for summer: pre-monsoon and post-monsoon. 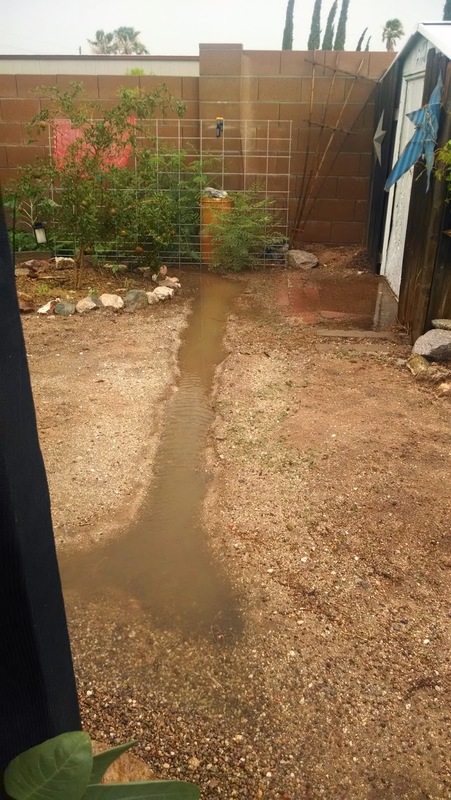 I'm hoping my post-monsoon garden does better than pre-. The tomatoes and green beans did well but not much else. The corn was a big flop and it is on sale for 6 for a dollar of something cheap like that. I don't think I will bother with corn next year. Next year I will grow sunflowers for shade instead of corn. At least I'll get a pretty flower.